‎12 Hours before STC Yasi and the wind is picking up already. We are all set for the event, Des has just connected the Generator and is load testing it. We have water, fuel, gas and food a radio, torches and batteries. The necessary windows are boarded up and we have our emergency pack ready to go if need be.If you have prepared well and you use your common sense we will all be fine. Stay safe Airlie. 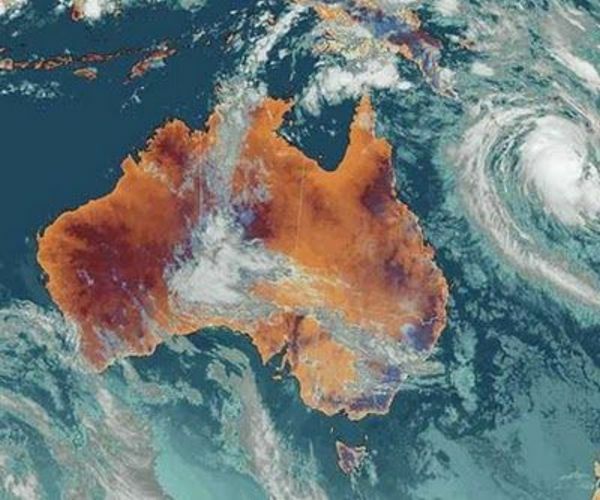 From another Queensland Blogger ...Yasi has been up-graded to a Strong category 5 this morning.It is 5oo kilometres wide.The eye is 30 klms wide.It will take an hour for the eye to pass over ,and then the 280 - 300 klm winds will return. It is the biggest storm we have ever experienced.The frightening radar images shown behind our Premier Anna Bligh gives you a good idea of the size. It is so hard to believe this is happening..just when you think it cant get any worse..it does. My thoughts are with all my fellow Queenslanders further north. Path Cyclone Yasi is taking. Nilo's son and Girlfriend managed to get to them from Townsville and they sitting somewhere down just past Mackay. It looks like a category 5 and they expecting it by lunchtime today. with the eye crossing at midnight. According to the weather people it will cover an area of 800km wide while the eye is 100 km wide. Severe winds up to 280km per hr that is as strong as Katrina. 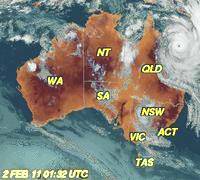 400 mls of rain is expected.This cyclone is stronger than Cyclone Tracy that devistated Darwin many years ago. Elise says ... Wow, Willis Island weather station has not updated for 40min, they presume it has been wiped out!! And they say this is the BIGGEST cyclone ever to hit Australia... May God protect all those who are in danger! She's a BIG girl !! No more rain is need in the state,and the days to come will be a nervous wait. Where the rain travels after that is however, a big worry. Our forecast is for winds and high seas for now. A few of our friends will be coming face to face with Cyclone Yasi. We're thinking of you all and pray you will be safe. Nilo and Des, who moved up to Airlie Beach a few months ago. Hope Al's well at your place, we'll be thinking about you. Yike, that is a big one! I hope everyone does okay when it hits. Oh my word!! What else can you guys get? It must be a scary time for all of you. I hope you all will be safe. Very scary. You guys need a break. I read about Yasi this morning. Bless ya'lls heart, Ya'll are being hammered this year. Take care. Everyone who will be affected by Yasi is in our thoughts. All I can think of is when Hurricane Katrina hit us down in Lousiana.It was such a mess.